The advanced Canon IR-6075 is a multifunction device that offers standard printing, copying, sending, storing, and scanning functions. The ImageRUNNER IR6075 mono laser printer has a standard 80 GB hard disk drive and is integrated with 1.5 GB of memory. Print resolution can go as high as 1,200 x 1,200 dpi while scan resolution is 600 x 600 dpi. 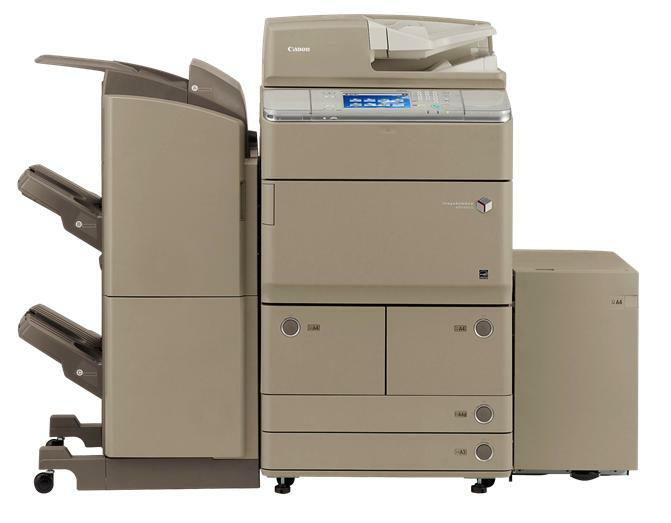 The Canon ImageRUNNER ADVANCE 6075 office black and white printer can continuously copy up to 9,999 pages. Support for PostScript and PCL emulation as well as the fax machine are optional. This model comes with a flatbed scanner that also has an automatic document feeder and a duplexer. Optional finishers are offered and the Canon IR-6075 copier can handle 7,700 sheets with optional paper deck. Print speed can go as fast as 75 ppm with the first page out in 3.1 seconds or less. Users can easily operate the Canon IR6075 black and white multifunction copier as it features an intuitive menu on its control panel, it is an 8.4 inch touchscreen display in full colour. Paper waste can be cut back in half with the automatic duplexer. The Canon IR-6075 mono multifunction printer can help save time as it has high-paper handling capacity and offers an automatic document feeder. It also offers scan-to-destination function and has a USB host for quick printing and scanning. Workgroups favour the Canon IR 6075 printer as it is compatible with Windows and Macintosh computers and has built-in Ethernet. The 6075 is easy and affordable to manage in the long-run with its large capacity black Canon IR6075 toner ensuring that print costs average themselves out over time out at a very low rate. Wi-Fi connectivity is optional and printer support for emulations must be bought separately. The main unit of the Canon IR-6075 ImageRUNNER ADVANCE laser printer is already pricey itself and yet it does not come with a standard fax machine.